As I sat down to write this article, I couldn’t help but get a little emotional about the fact that something as competitive and amazingly fun as sailboat racing can give you so much. At LISOT (Long Island Sound Optimist Team), we train hard and push our sailors to want to be the best. But most importantly, we do it in hopes they will come to love sailing, since it’s a sport that’s given many of us so much. I’m a 34-year-old Argentinian. As the Optimist Head Coach of LISOT, I first came to the U.S. from my native Argentina in 2009 and haven’t looked back. I live in Darien, CT with an amazing LISOT family who have hosted and adopted me as a member of their own family. I started sailing Optis in the shallow waters of the Rio de La Plata when I was nine years old. I’ve sailed and coached many classes including 29er, 49er, Lightning, Cadet, Snipe, and big boats of the IMS and ORC classes. I’ve won 12 national championships in four different classes, and finished second at the 29er Worlds four times. In all that sailing and the many trophies I’ve been fortunate enough to collect, what I find most satisfying is knowing that the real magic of sailing is not racing results, but the love of an amazing sport. Sailing has enabled me to make friends from everywhere, and it’s a sport that provides something that no gold medal can deliver – a lifetime of friendships. As someone who has coached many youth sailors in the International Optimist class at many world and continental championships, the Opti is the class I’d like to use to explain the word “sailing.” As a coach, we train our sailors for long periods of time to compete at Worlds and other international regattas. As a keen youth sailor, you may find yourself at a major regatta in a foreign country with a group of young sailors, all under 15 years old, along with 200 to 1,000 other sailors (depending on the event) from many other countries. At first, everyone is a stranger. They don’t speak your language and you don’t speak theirs. They don’t dress like you, you don’t dress like them, and you have different customs. You’re 1,000 strangers, but all with the same passion! Suddenly, these 1,000 strangers realize they all have something in common, and although they may only speak one language, “sailing” is regularly spoken by signs and smiles. Now that you have an idea of what youth sailing can be about, let’s talk a little about my LISOT sailors. This past February, we competed at the International Sailing Week in Mar del Plata, Argentina, located 250 miles south of Buenos Aires. I took 16 LISOT sailors to train and compete at this amazing venue for almost two weeks. This trip, however, was about much more than racing an Opti in 25-30 knots of wind and gigantic 15-foot rolling seas on the open South Atlantic. This program teaches sailing to underprivileged kids, taking them out of the streets and giving them a reason to smile and friends to have fun with. The results have amazing. Many of these kids have raised their grades significantly at school and became more responsible, but most of all they have became extremely happy simply because they’ve been able to spend time enjoying the Optis, wind and water. The request we received from Nico was very simple. The Missions school was flooded a few years ago and they lost everything. The aftermath of the disaster left them in need of sailing gear and equipment. Their classroom, a metal shipping container, was destroyed during the flooding. This year, LISOT Opti sailors TJ Danilek, Carmen and Emma Cowles, John Eastman, Owen Hennessey, Teagan Cunningham, Sofia Segalla, Jack Solmo, Oliver Hurwitz, Aidan Iaconis, Max Anker, Nick Chisari, Bella Casaretto, Connor Mraz, Leyton Borcherding and Gavin Meese started collecting clothes and sails from everyone and everywhere. In just one month, they collected over 100 pieces of sailing gear including boots, spray tops, rash guards, gloves, life jackets, sailing T-shirts, leggings, and many, many Opti sails! Most importantly, they personally delivered everything to the kids in Argentina. In Mar del Plata, we got the LISOT sailors together with the sailors from the Vamos con Viento a Favor program. When the Argentinian sailors saw what our sailors had brought down from America, they were in shock. Smiles never stopped, and there were hugs and tears of joy all around. It was an extremely rewarding experience for all of us. This special moment culminated in a 60-sailor soccer match with only one rule: Smile. With kids running as fast as they could behind the ball, there was screaming like it was the World Cup. After the match we cooked pizzas on the grill and had an amazing dinner to remember. Today, as we approach summer in America and winter in Mar del Plata, sailors are in touch with each other (oh, how the Internet makes that so easy). 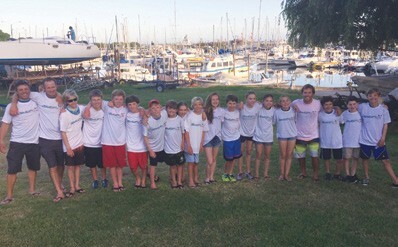 Our sailors followed their new friends and cheered them on at Argentinian Opti Team Trials, while they are following LISOTers at U.S. Opti Team Trials. Vamos con Viento a Favor just qualified one sailor for the National Team that will represent Argentina at the 2015 Opti Worlds this summer in Poland! I remember back in the 1990s, in the days before email, sending letters to my new sailing friends from around the world after my first international regatta, the Optimist European Championship in Spain. Those letters took seven days to get there and another seven days to receive a reply. Without the magic of the Internet, it was quite a different “conversation.” I still have those letters at home in Argentina. Today, letters have become emails and what took 14 days now takes seconds, but the most important thing is that those friends I met at that regatta are still my friends for life. The donation of equipment was the means to enable LISOT sailors to make friends for life. I am very proud of my sailors for their attitude, and thankful to my own Optimist coaches in Argentina when I was young, who taught me the true meaning of the word “sailing.” To be able to share this unique spirit with my LISOT team is simply incredible. When he’s not sailing or coaching, Pepe Bettini enjoys surfing and spending time with his family.